fromTheDailyBell: One of the key themes from George Orwell’s dystopic novel 1984 is that the Party can do and say whatever it wants. And more importantly, you must believe it, with all your heart. No matter how absurd. fromCreators: Why is Donald Trump's approval rating surging? Look at what he is compared to. 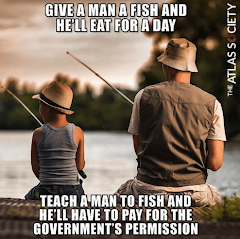 fromCreators: "When plunder becomes a way of life for a group of men in a society, over the course of time they create for themselves a legal system that authorizes it and a moral code that glorifies it." fromChristianScienceMonitor: Because juror deliberations are private, and rarely discussed afterward, it’s unclear how much nullification may be happening even without juries being instructed. fromChristianScienceMonitor: The primary danger of smoking pot comes from police. fromZeroHedge: Pimping the "Trump and his supporters are racists" narrative at all costs. 2 hours in jail for cop who killed Botham Jean. 2 nights for people protesting His Death. fromReason: The state serves and protects its own agents. The public, not so much. fromBloomberg: So where is Jeff Sessions in all of this? The little rat-faced tyrant is probably too busy spreading lies about medical cannabis to do his job. fromCreators: In ordinary, as well as professional, conversation, we use terms such as discrimination, prejudice, racial preferences and racism interchangeably, as if they referred to the same behavior. fromOregonLive: The shameless government in Oregon, angry that citizens went over their heads with a cannabis-legalizing proposition, refuses to stop harassing medical users by pretending to fight the black market. fromMises: In America's beginning, the vast majority of legal matters were extremely localized. And it stayed that way up until the ruling class decided they wanted the power dictate. fromCNSNews: Will they be called The Welfare Generation? Today, growing up in a country where the majority of their peers live in households that take "means-tested assistance" from the government. fromWND: An Obama administration decision to ban incandescent light bulbs was based on a misunderstanding of the law, according to DOE, meaning those faithful products that had been in use for a century may be returning. fromForeignAffairs: Why long wars no longer generate a backlash at home. fromLibertyPen/YouTube: Nearly 30 years after Apartheid, South Africa returns to racist policies, confiscating the land of whites without compensation. So far, the U.S. government has no problem with this. fromArmstrongEconomics: 97 percent of ALL federal convictions plead to whatever the prosecutor tells them to say. If not, you go to prison for most of your life. In the 1970s, the conviction rate was 72%. Today, it is 98.7%. fromRutherfordInstitute: When you’re a prisoner in your own town, unable to move freely, kept off the streets, issued a curfew at night, there can be no mistaking the prison walls closing in. fromDW: Mexico's incoming president has granted his interior minister "carte blanche" to consider legalizing drugs. The new Mexican government has promised to respond to record-high violence with a package of judicial reforms. fromSacBee: San Francisco became the first city in California to allow non-citizens to vote in local elections following passage of Measure N with 54 percent of the vote after two previous failed tries. fromCreators: The power of American arms-makers is formidable. They have acolytes in all branches of government that fear if a Trump-Putin deal is reached, there may be a diminished appetite for their weaponry. fromTheFreeThoughtProject: After an officer was caught on camera pulling his gun on a group of children, his department responded by arresting more children. fromReason: A predictable outcome. State judges routinely do the bidding of the state politicians who appointed them. To hell with what the people want. fromLibertyPen/YouTube: Medical schools are discriminating on a massive scale as less qualified African-American and Hispanic students are routinely given priority over higher scoring Whites and Asians. fromNYPost: Both SF and NY are one-party towns. They’re incubators of uber-liberal policies. Both cities have produced astonishing inequality, an ever-shrinking middle class and a deepening homeless problem. MSNBC does not merely permit fabrications against Democratic Party critics. It rewards them. fromTheIntercept: NBC News and MSNBC have essentially merged with the CIA and intelligence community and thus, use their tactics. The network is filled with former generals and CIA officials. fromReason: Author Warren Farrell says welfare programs encourage fatherless households. fromZeroHedge: In China, where firearms are tightly restricted, it’s probably no surprise that those who want to hurt people found another way to do it. fromWashingtonExaminer: This barely includes the effects of the recent fiscally irresponsible tax and spending legislation, which added more debt on top of an already unsustainable trajectory. fromTED: Theo E.J. Wilson tells the story of becoming Lucius25, white supremacist lurker, and the unexpected compassion and surprising perspective he found from engaging with people he disagrees with. fromLibertyPen/YouTube: Google is not a champion of free thought but neither is the government. fromTownhall: Those who are driven primarily by emotion tend to see all imperfection as an outrage that must be corrected. To these people, trade-offs are heartless and vile. But -- there is a limit to endless outrage. fromLATimes: Hundreds of people cracked open wallets to help fund their dream of carving — out of California’s northernmost reaches — a brand new state. fromSpectatorLife: Thanks to the internet, millions now have access to views mainstream media considers ‘forbidden’. Douglas Murray examines the freethinkers leading the charge. fromReason: And they'll make lots of other things more expensive too. fromTedxTalks: An ugly self-hating racist seems to believe that whites are incapable of administering justice. VIDEO: How real is fake news? fromTedxTalks: Was the effort to focus America's attention on the idea of “fake news”—itself a propaganda effort? Connect the dots and learn who’s behind it and why. It’s not what you think. fromTedxTalks: Sparkling insights from Professor Sowell captured from various episodes of Uncommon Knowledge with Peter Robinson. fromReason: This from a guy who bemoaned the lack of due process just weeks ago. fromLibertyPen/YouTube: Mark Levin breaks down the extent of corruption brought about by the Obama administration. fromCitizenTribune: We can only hope they can do what the government tried and failed to do with the Affordable Care Act - make health insurance more available at a more affordable price to more Americans. Americans wanted more privacy protections. Congress gave them fewer. fromSlate: You don’t have to be a criminal or a terrorist to be affected by Congress’ Section 702 surveillance expansion. fromReason: The FBI’s disappointing surveillance of Carter Page illustrates the difficulty of implicating the president in illegal collusion. fromYouTube: A Daniel Hannan video. fromLibertyPen/YouTube: Members of social justice group Student United Ithaca became 'triggered' after a white student landed the role of Esmeralda in production of 'The Hunchback of Notre Dame'. fromTheNationalInterest: The Department of Justice wants the court to take liberty away from people, not to expand it. fromTheFreeThoughtProject: The investigation found that less than 1 percent of the 65,000 complaints filed in the state resulted in the officers being charged with a crime. fromIntellectualTakeout: California's gasoline tax rose by 12 cents per gallon on Nov. 1, bringing it to nearly 40 cents per gallon. fromLibertyPen/YouTube: Five minutes of wisdom from the lips of the master. fromDownTrend: Thieves demand equal opportunity. fromCreators: Voters must demand transparency and accountability, or they will continue to witness the unraveling of our democracy and system of justice — one text at a time. from Bloomberg: The Deep State is being challenged at last. What will happen when push comes to shove? from Rutherford Institute: The Rutherford Institute has asked the Supreme Court to prohibit police from entering private residential property uninvited and without a warrant, in order to search a vehicle parked a few feet from the house. from Journal Sentinel: The last count was for profanely berating and insulting her 14-year-old son after he burned some popcorn. The boy had been talking to a friend at the time, who heard the tirade over the phone. from TheNewAmerican: Bigotry against blacks would never be given an outlet in a college newspaper. Neither should bigotry against whites — or anyone else. from USNews: Whether police lied about testing discarded tea leaves found in a Kansas couple's trash to get permission for a SWAT-style raid is the focus of a federal trial. from Dangerous: The Venezuelan Soccer Federation claims that the under-20s national women’s soccer team was “largely insulated” from the country's food crisis, where citizens have been forced to raise pet rabbits for food, and even hunt flamingos. from SlowtoWrite: Samuel Sey: The term Uncle Tom is a racial slur for Black men perceived as submissive to White people—Black men like me. I am perceived as submissive to White people because I do not submit to Black people. from Common Dreams: Sixteen years of autopilot wars, but who’s counting? from Creators: America was founded on an act of secession from England. So why do so many people now see secession as a terrible thing? from the Federalist: Early minimum wage proponents knew what they were doing, by pricing “undesirable” workers out of the labor force to perpetuate minority poverty. Let’s not finish their work for them. from The Manual: “Well, at least it can’t get any worse.” These days, that seems to be the mantra for most air travelers just before the Transportation Security Administration (TSA) enacts some new program that does just that. from Reason: "The expansion of federal power has not been steady and inexorable; it has grown through sudden, quantum leaps in times of emergency, most especially war. The crises eventually subside, but many of the powers remain—to be built upon later when the next crisis unfolds." from Miami Herald: As Venezuela’s economy continues to collapse amid food shortages, hyperinflation and U.S. sanctions, waves of economic refugees have fled the country. from RT: RT is a Russian news outlet and should be taken in context. The cellophane patriot McCain wants them censored, but that is not the values of the true American patriots who founded this land. from Creator's Syndicate: Many colleges have become hotbeds of what might be labeled as enlightened racism. Students at the University of California, Berkeley created "safe spaces" for people of color. from Reason: The president is sending a message that law enforcement has more latitude now to bend and break the rules. from HotAir: "The local retailers report that more than 4 in 10 local stores have seen a drop in beverage sales of at least 30%." from Independent: Cops beat up the reporters who were chronicling their actions. This is a football story with both political and legal implications.